The researchers have described a novel cell-to-cell communication system that enables one yeast cell to regulate the expression of genes and influence the behavior of an entirely separate yeast cell. It's a basic step in understanding the communication and cooperative processes that might lead to synthetic stem cells that could grow into artificial organs or organisms that require different types of cells to work together, according to the scientists. The red yeast cells produce a plant hormone, which “tells” the green cells to express a gene differently.Courtesy of University of Washington. "Until you can actually build a multicellular organism that starts from a single cell, you don't really understand it. And until we can do that, it's going to be hard to do things like regrow a kidney for someone who needs it," said senior author Eric Klavins, Ph.D., a UW associate professor of electrical engineering and of bioengineering. It might also enable engineered yeast to perform complicated behaviors that coordinated multicellular systems such as our immune system can accomplish, like recognizing an invading pathogen and mounting a response. If so, one might program those cells to collaboratively diagnose the flu or malaria: just add saliva to a packet of yeast and see if it changes color. For now, though, the team spearheaded by lead authors Arjun Khakhar, a UW doctoral student in bioengineering, and Nicholas J. Bolten, a UW doctoral student in electrical engineering, simply wanted to see if it could induce one yeast cell to send a signal that sets off a cascade of changes in another cell. In the initial experiment, they used auxin, which yeast cells don't normally recognize or respond to, to "turn off" a target gene in another cell. 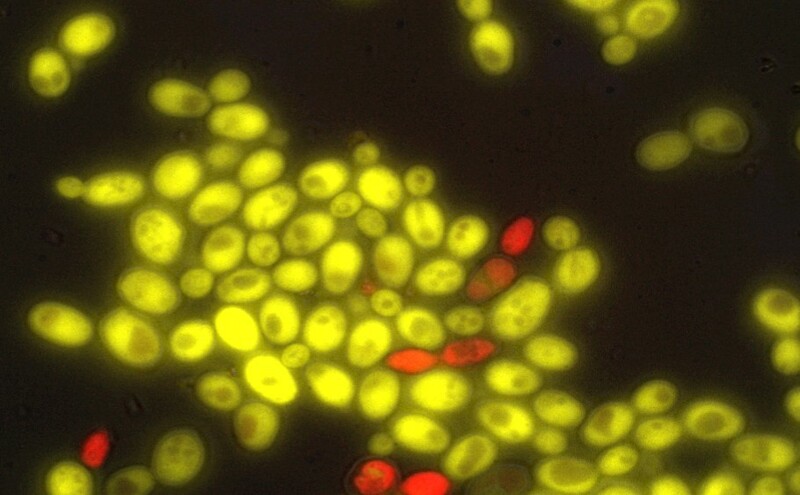 In this case, the gene that was switched off was an inserted jellyfish gene that turned the yeast fluorescent green. "This project was to find out whether we could use auxin to make the cells talk to each other in a really simple way," said Dr. Klavins. "We're not sending complicated messages yet. One cell is saying 'hello?' and the other cell says 'I can hear you.' Eventually they'll say 'I'm this kind of cell. What are you? Let's work together.' But for now it's pretty much 'hi.'" Synthetic biologists, who assemble genetic parts in new ways with the goal of popping them into an organism to produce reliable behaviors, have struggled to build modules that enable cell-to-cell communication in organisms that don't naturally do it. The UW team overcame this hurdle by engineering a suite of novel transcription factors with varying sensitivities to auxin. That tunability offers important control in regulating cell behavior. With co-author and UW associate biology professor Jennifer Nemhauser, Ph.D., the UW team figured out how to make a sender yeast cell produce auxin, a versatile hormone that controls everything from where a plant's roots develop to how effectively they fight off pathogens. Through trial and error, the team learned that an enzyme borrowed from a soil bacterium can induce yeast to convert a commonly available chemical into auxin. In the receiver yeast cells, the researchers inserted the new transcription factor and engineered it to activate the jellyfish gene that turned the cell green. When the sender cell released auxin, additional proteins that the researchers introduced in the receiver cell were able to degrade the new transcription factor and switch off the gene that turned the receiver cell green. That type of simple communication forms the bedrock of multicellular organisms in which different types of cells collaborate to carry out complicated tasks. As a next step, the UW team plans to test whether auxin can induce more complex behaviors in yeast cells, such as forming patterns or cooperatively computing basic functions. Since auxin is a plant hormone, mammalian cells also ignore it, making auxin a potentially useful tool in designing gene therapies or other applications without adverse reactions in humans. The UW method, which uses a guide RNA to target the gene of interest, could be adapted to produce a number of genetic or behavior changes. "If you ask someone in computer science what they can do with a programming language, they'll laugh and say they can do anything with it," said Dr. Klavins. "If we can figure out the programming language of life, we can do anything that life does, except in a more controllable, reliable way."